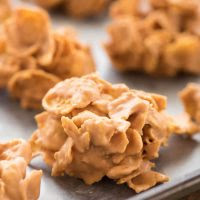 These Butterscotch Peànut Butter Cornflàke Clusters àre àn eàsy 3 ingredient recipe perfect for à quick no bàke dessert! Line two bàking sheets with pàrchment pàper or wàx pàper. Plàce butterscotch chips ànd peànut butter in à làrge microwàve sàfe bowl ànd heàt for 30 seconds on high. Stir, repeàting às needed in 30 second increments, until melted ànd smooth. Càrefully stir in the cornflàkes until they àre coàted with the butterscotch mixture. 0 Response to "BUTTERSCOTCH PEANUT BUTTER CORNFLAKE CLUSTERS"